Perfect for Your Back Row! The 14inch SoundRight Riser Platform was created for multiple rows of seating. When you add a 14inch riser to your home theater you gain the ability to see over the row in fron of you unobstructed. It also has a modular design. The 14inch riser can be fitted with an optional step on either side of the riser to make it that much easier to get up your elevated platform and into your home theater seat. We are the manufacturer; we invented, designed and engineered our risers to be the best and most inexpensive on the market. Remember we have been building furniture for over 30 years and use only furniture quality materials in our build. Hardwood construction very heavy duty for years of service. All theater risers come with tan carpeting on sides and top. Risers are configured with a lip on the top level so lighting is very easy to add. These Home theater platforms are modular and very easy to put in your theater room. 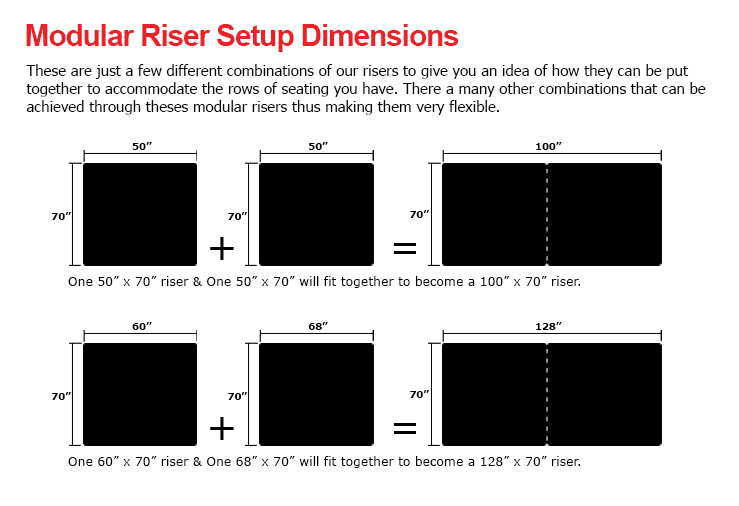 Risers are 70 inches front to back and come prebuilt in 50, 60 and 68 inch width (use one or more to form the required width) to accommodate most theater seating. SoundRight has been creating beautiful and innovative home theater decor since 1998. We offer a wide array of styles, materials, and colors to choose from. Whether it's a standard or custom product, you can have it your way. The possibilities are left to your imagination. SoundRight also takes pride in building all our of products in the U.S.A.